Former FBI director and Anchorman enthusiast James Comey just joined Twitter. Well, to be precise, Comey just confirmed that the account that once had the handle @projectexile7 and the name Reinhold Niebuhr indeed belongs to him. It now bears the username @Comey and sports a little blue “verified” checkmark. Oh and also he’s writing a book that you can buy next spring. 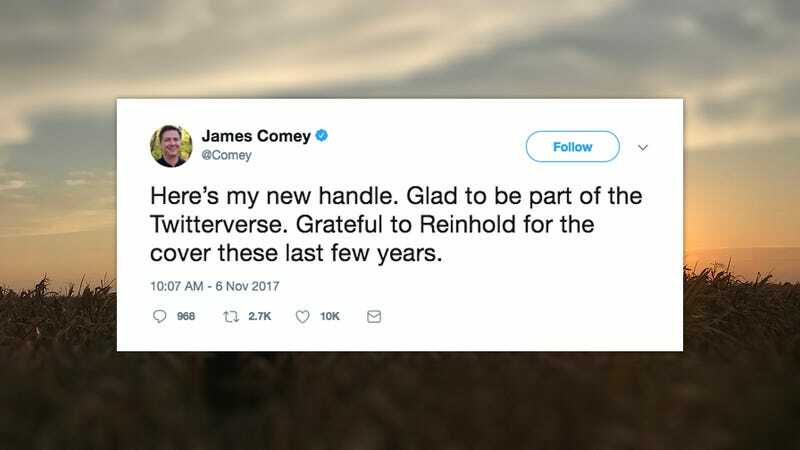 On Monday, Comey nodded to his former alias by tweeting: “Grateful to Reinhold for the cover these last few years.” We’re grateful, too, Mr. Comey. Former Gizmodo writer Ashley Feinberg was the first to link Comey to the Reinhold Niebuhr account back in March, and boy was that a fun day in the newsroom. That day, you see, happened just before the wheels fell off. It was about a month before President Trump unceremoniously fired Comey. At the time, the White House claimed it was due to Comey’s handling of the Hillary Clinton investigation. But soon after, Trump made it pretty clear that Comey got fired because he was doing his job and moving forward with an FBI investigation into Russian meddling in the 2016 election. That investigation, now led by special council Robert Mueller, has resulted in the indictment of three men in Trump’s orbit and one guilty plea. So Comey, an Obama appointee fired by Donald Trump for serving his country, is a different character in American history now than he was in March. Some might say that Comey’s commitment to justice over loyalty to president was the best thing anyone has done in the Trump administration. They might also say that Trump’s firing Comey for investigating his cronies simply suggested that Trump himself had something to hide. Even now, it’s almost cliché to call Trump’s purported efforts to obstruct justice “Nixonian” because it’s just so accurate. And look at that bio. It’s a total dad bio! Especially when you look at it underneath that charming photo in the woods. The scene is so wholesome, you can only assume that there’s a black lab running around somewhere out of frame. It makes you wonder: Did James Comey hire a social media manager? Did his publisher make him get legit on Twitter? Will the old Reinhold Niebuhr Instagram account come to life, too? Or will James Comey make this “James Comey Official” Instagram account public? Back in March, it was pretty clearly a response to Feinberg’s investigation, but the tweet takes on added significance post-verification. Is it a clue? Is Comey trolling us? Does this guy just really love Anchorman? You’ll have to buy his book to find out.